REDDING, Calif. - Simpson University senior Janelle Roth’s recent Student Research Symposium presentation about media and propaganda in China and North Korea had an unlikely current news tie: basketball star Dennis Rodman’s visit to the latter country. "He is an interesting representation of our culture," she said. "I am more interested to see what comes about of it, if anything. But what I can say is that if there is any time in history that I would like to be in Dennis Rodman's shoes, it would hands down be during his time with the leaders of North Korea." Roth was one of 33 students who presented talks or posters about research projects—and answered audience questions—during the free, daylong event. Visitors, who received a complimentary lunch in the campus dining center, could choose among multiple 10- to 30-minute presentations on a variety of topics. 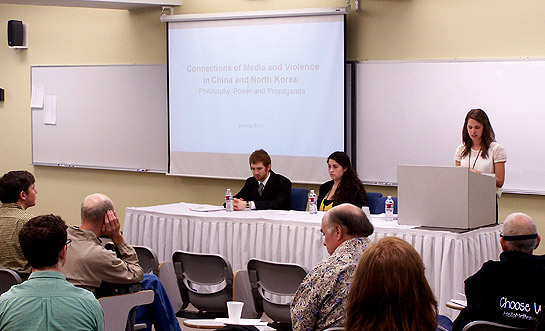 The symposium emulates a professional academic research symposium, where scholars present their work in a formal setting. It gives Simpson students an opportunity to showcase their learning, and, in some cases, original research. An afternoon presentation by five undergraduate psychology students highlighted ongoing research being conducted by professors Wayne Norman and Danielle Beck. The students helped gather data by conducting tests on fellow undergraduates to measure heart rate variability during certain cognitive tasks. Dani Perez, a psychology major from the Bay Area who transferred to Simpson last year, was part of the team that presented at the symposium. Roth said she chose her topic of media and violence after studying in China during the spring 2012 semester. Already aware of the government’s attempts to censor news and social media outlets to its citizens, she said she got a firsthand taste of it when the Chinese government hacked into her computer. "After having my computer hacked and numerous files deleted, as well as third-party members listening in on Skype conversations, I began to think about all of the freedoms that I was granted in America, that I did not have while studying in China,” Roth said. “This spurred me to research more about the topic, once I was home and able to search such topics as media censorship that I could not search while I was in China." Other symposium presentations included such topics as “The Romanticization of Pocahontas: Discovering the Truth Behind the Legend,” “The Value of the Arts in Peacebuilding,” and “Three in the Bed: Co-Sleeping and its Effect on the Marriage and Family.” Two students presented the results of chemistry studies done on the campus pond. Presenters represented 14 Simpson University programs, with 25 undergraduate students and eight graduate students giving 20 talks and displaying nine posters. Red Bluff resident Roger Cox, a physician who ran for Tehama County supervisor in June, attended the symposium to see his nephew, Stephen Lennstrom, who addressed audiences in morning and afternoon sessions on the topics of church and state relations and the psychology group research. Learn more about the Student Research Symposium and read summaries of the presentations at simpsonu.edu/researchsymposium. -Photo: Janelle Roth, right, gives her presentation. Seated are student presenters Stephen Lennstrom and Jiovanna Aguirre-Smith.